Where Are You Planning Your Next Corporate Meeting? Have you been assigned the task of picking the place for your next corporate meeting? There’s a lot riding on this decision as your friends may have mentioned said it had better be nicer than the last place you met! You’ve had little luck making a list of typical places you’ve heard about. A few are too small. Now you’re trying to think outside the box for a place that is unique and attractive for all different types of people. 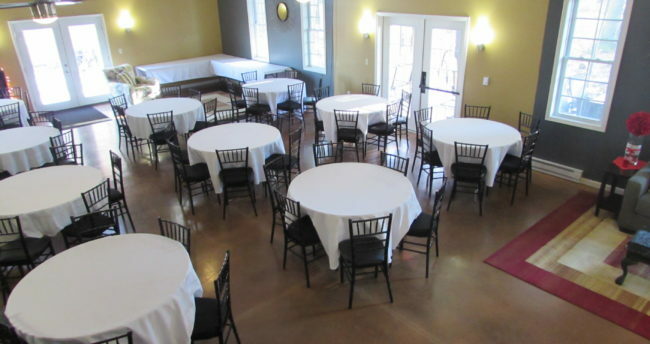 Have you thought about having it at a local winery that has meeting rooms? Many have expanded to include these event venues. Some stand out above others as being more tastefully decorated. Deer Creek Winery in Shippenville, PA is one of them! Whether you’re having a small executive meeting of just 8-12 people or need a full room of 125, we can help you! There are several venues to choose from and all have various amenities necessary for an effective meeting like a sound system or projector/screen. Of course, you also need to keep everyone hydrated and fed, so Deer Creek Winery can take care of that for you. After the day is complete, a glass of wine together is always good to just wind down and get to know each other a bit more. The Inn at Deer Creek Winery is attached to our winery and has 8 beautifully decorated rooms. Your executives and clients, whom you want to treat royally, can stay right here so they’re ready for the next day! So many in the younger generations of workers want something a little different. A change of atmosphere can help get the creative juices and thoughts flowing for new ideas! Deer Creek Winery has many areas to lounge and lots of space to take breaks and walk around too. We’re just 15 minutes from other restaurants for a night out, as well, and other hotels for the rest of your overflow team that doesn’t fit here at our 8 room Inn B&B. Call for your tour today and see what Deer Creek Winery has to offer for your next corporate meeting. Impress your colleagues for finding such a great venue for your next business meeting!